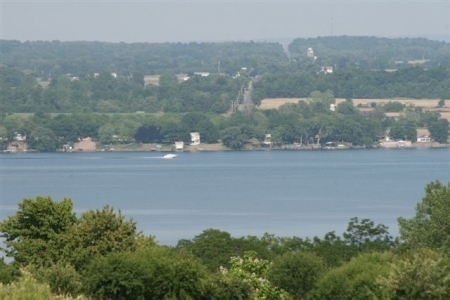 The Cobtree resort provides the Finger Lakes region's premier self catering cottage vacation rentals. The spacious and well equipped cottage provides a cost effective alternative to cabins or chalets, for parties of up to 8 people. Cayuga Cottage is identical to its nearby twin Seneca Cottage and is also a traditional brick built house in an 'English Cottage Style' it has over 1460 sq ft of living area, three bedrooms, two bathrooms, a basement with washing machine, drier, iron and ironing board, a Log effect gas stove in the lounge, full gas fired forced air heating throughout, hardwood floors, spectacular views over Seneca Lake on one side of the property and open farmland and woodland on the other side. Peaceful, tranquil and breathtaking views over the Lake and beyond. Simply 'breathtaking'! Cayuga Cottage offers guests deluxe living accommodation with views over looking Seneca Lake and scenic rural views all around the property.